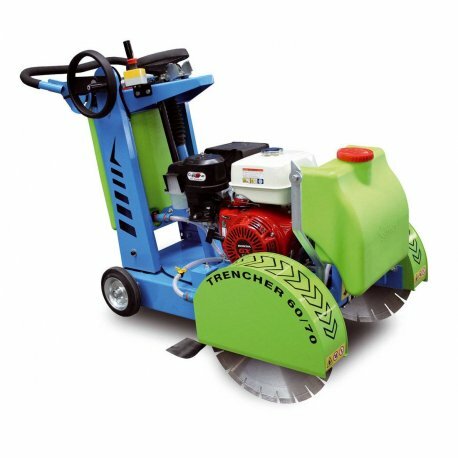 Trencher is a double blade asphalt / concrete cutter. Its main function is to carry out parallel cuts in one pass for subsequent excavations. It can also be used as a conventional asphalt/concrete cutter, placing the blade on the right or left of the machine. Ø500 mm (20”) blade guards available as optional. (Only for versions Honda 23Hp, Kohler 18Hp and Lombardini 16Hp). It can cut with just one blade, either on the right or the left side. Locking system of cutting depth. Cyclone air filter 13Hp Honda motor version. Oil level dipstick and oil drain plug. Hubcups at front and rear wheels to protect the bearings.